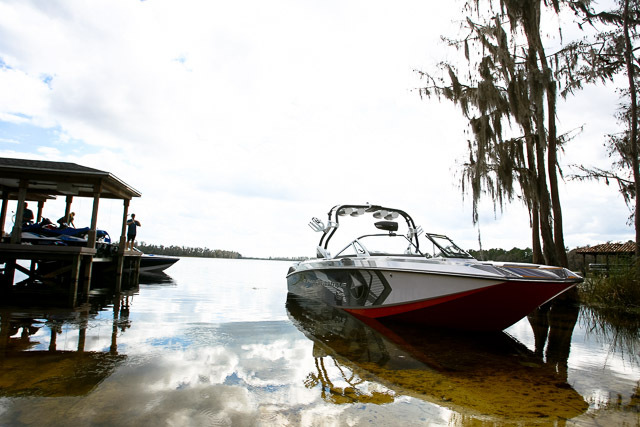 Tuesday morning in Orlando marked the official launch of Nautique’s new wakesurfing accessory available for their Super Air 210, 230, G23, and G25 boats – the Nautique Surfing System (NSS). A bunch of media members and team riders gathered at Lake Pickett for a demo of how the system works and the opportunity to ride in 70 degree water under sunny, 80 degree skies. 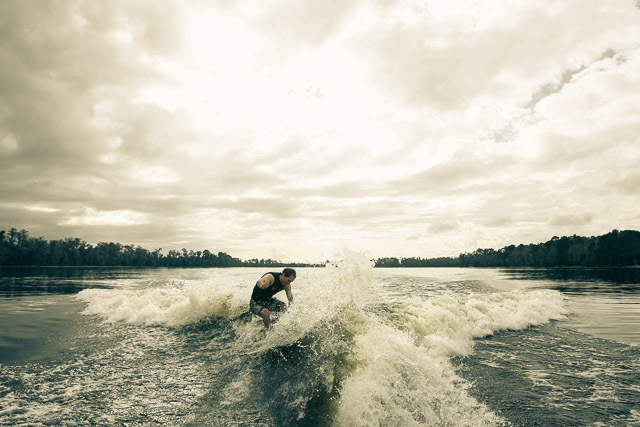 What can we say, January in Florida can have its perks. 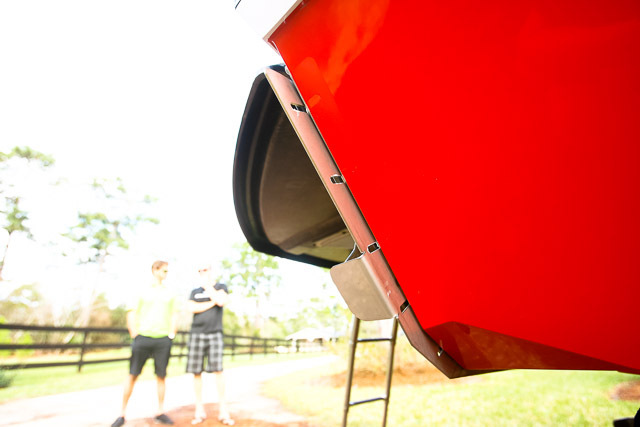 The first part of the new NSS is the Waveplate, which is mounted on the port and starboard sides of the boat under the swim step. 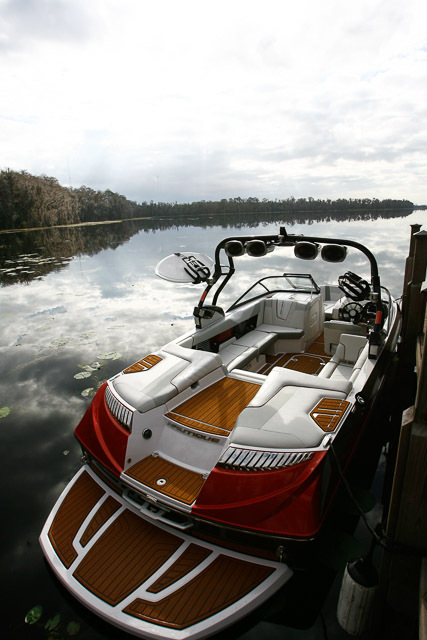 The Waveplate is controlled using Nautique’s LINC system in the dashboard. 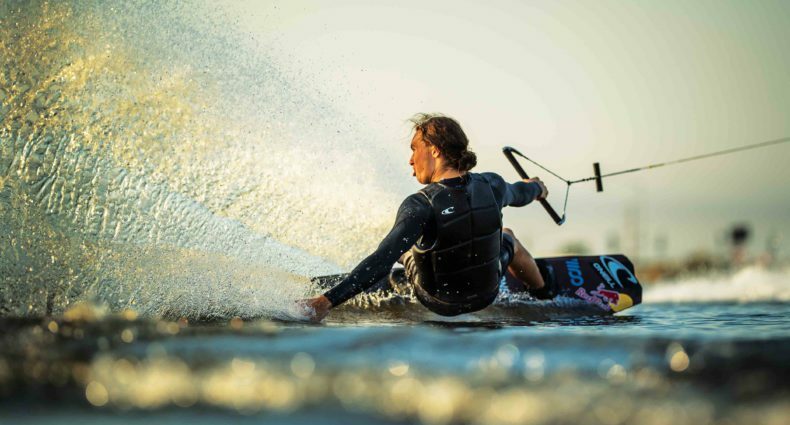 Push a button and the Waveplate of your choice is deployed, instantly creating an amazing wakesurfing wake. The key factor here is the instant part. 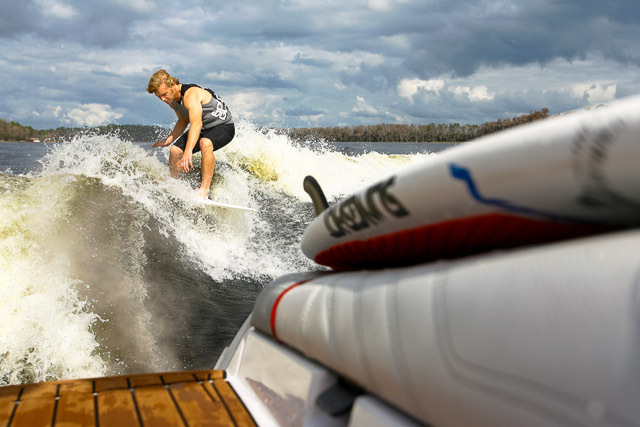 Normally wakesurfing requires moving ballast and people all over the boat, and if there are left and right foot forward riders who both want to surf frontside waves, well, then you have to move ballast and people more than once. 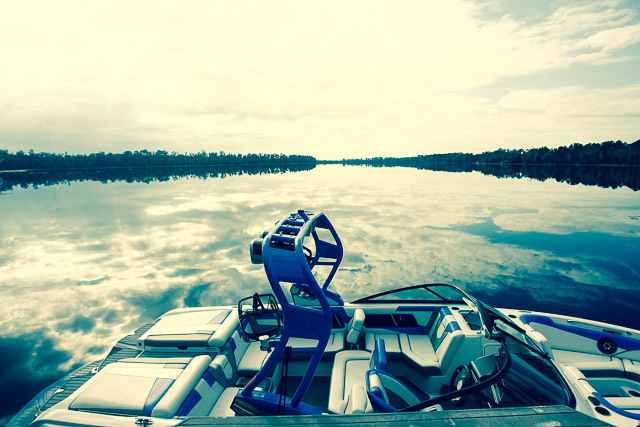 In the brand new G23 with a boat full of people and just stock ballast, not only could riders ride on whichever side of the boat they wanted, they could transfer from one side to the other in the middle of riding. And we didn’t have to add or drain any ballast in any part of the boat. The Waveplate does the work for you, which is pretty darn convenient. Obviously wakes can be tweaked even more to a rider’s preferences by moving people around and putting ballast in certain areas, as well. 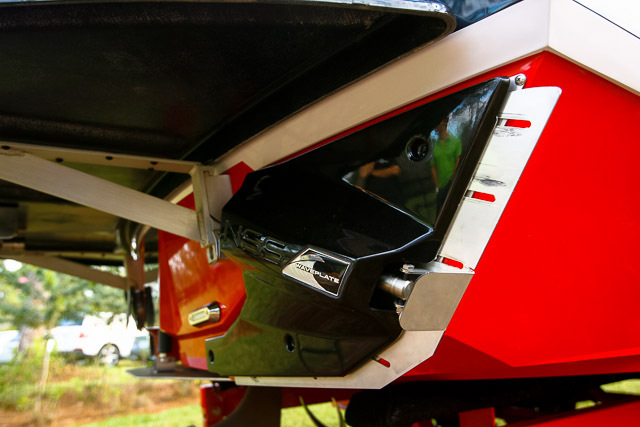 Because the Waveplate is controlled via Nautique’s on-board computer system, the NSS is more or less idiot proof. The Waveplates can only be engaged when the LINC system is in surf mode and the GPS cruise control is set to a speed of 13 MPH or slower. We spent the day having a blast and trying to make “the transfer”. Surprisingly enough, after a few tries, almost everybody was able to get it and transfer from one side of the wake to another as the driver switched the Waveplates. Usually a missed transfer came down to rider/driver communication breakdown and the Waveplate was switched too early or too late, either way it made for some good laughs. Guys like Byerly and Czeschin were trying to trick while transferring, which was also cool to watch. 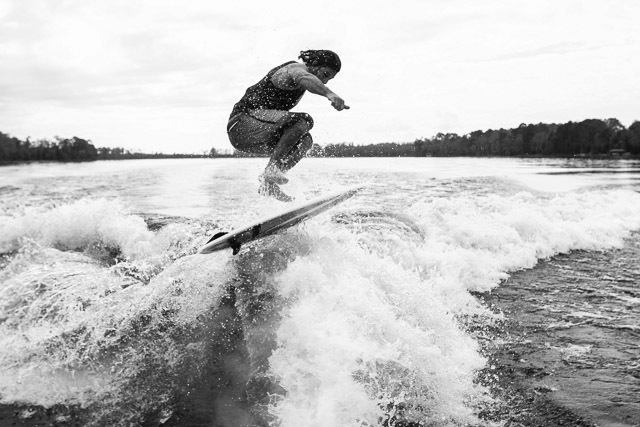 The NSS brought a whole new element of fun to wakesurfing, which is already pretty fun as it is. Throughout the morning we got to ride behind the 230, G23 and G25. The G25 is a beast. Seriously, it could sleep a family of six fairly comfortably. In terms of passengers the thing is rated for 19, so we piled in and had some more fun surfing, transferring, and enjoying the weather. If you’re in the bow you might need to use your cell phone to talk to somebody in the back of the boat, but that’s okay when you’re watching the action, whether it’s just 10 feet behind the boat or 85.